Both the United States and Canada offer some dog-friendly national parks where you can hike and bond with your best canine pal. These days, when I go on vacation, it’s usually to a national park. 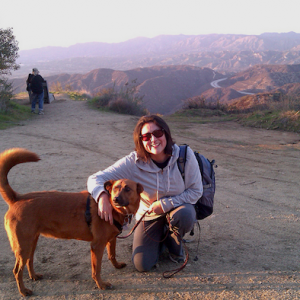 I love to lose myself in nature and hike for miles with my Border Terrier by my side. Sadly, many U.S. national parks don’t allow dogs on trails and in wilderness areas. Instead, they limit dogs to parking lots, campsites and paved roads. Unfortunately those no-dogs-allowed parks include some of the most famous ones, such as Yosemite, Yellowstone and Grand Teton. The good news: There are some notable exceptions in a few states. 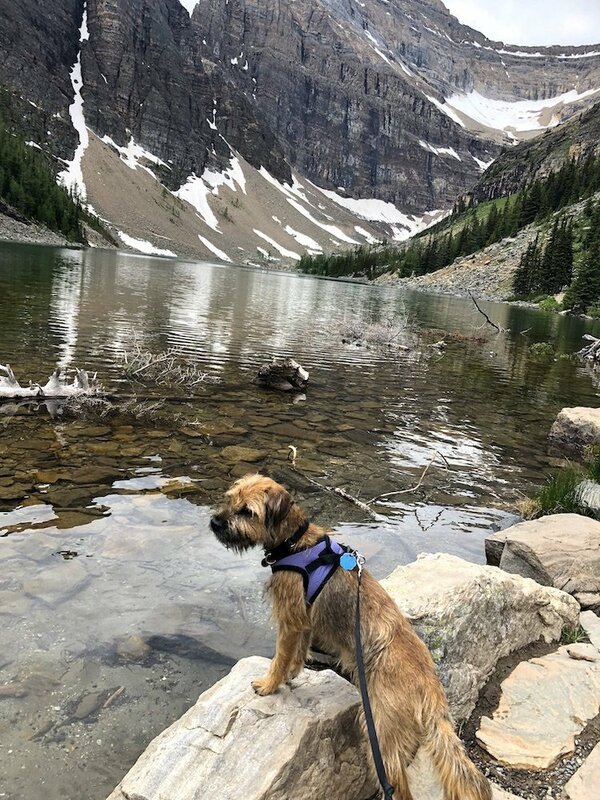 What’s more, Canada, our scenic neighbor to the north, has a wealth of national parks, and dogs are permitted in all of them, provided they dogs are accompanied by a person and are on a leash. Nestled in the Canadian Rockies, Banff National Park is famous for its majestic peaks and jade-colored lakes. You’ll find a wide variety of hikes, some leading to mountain summits, others to waterfalls, lakes and meadows studded with alpine flowers. 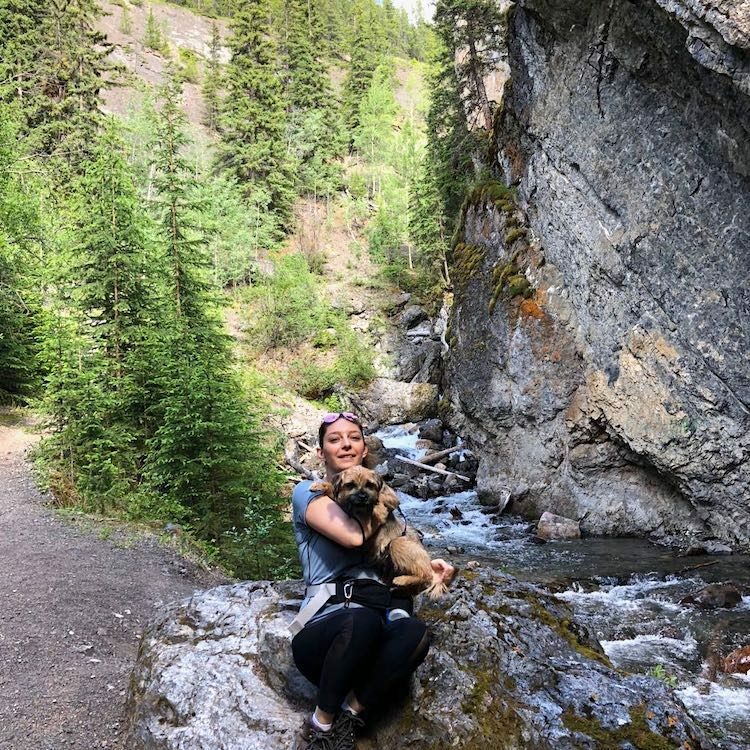 I particularly enjoyed the Plain of the Six Glaciers — the views of the lunar-like rocks and glistening ice are stunning, and my dog was thoroughly entertained by all the darting chipmunks on the trail. If time permits, take the Icefields Parkway up to Jasper, another famous national park in the Alberta province. The 4-hour trip through the Rockies is rumored to be one of the world’s most scenic drives. Spanning several islands along Maine’s stunning coastline, Acadia National Park boasts more than 100 miles of pet-friendly hiking trails. Just about the only places dogs aren’t allowed are a handful of the steeper trails and 2 swimming beaches. Dogs are permitted on the beaches outside the busy summer season, though — and if you’re a leaf peeper like me, there’s no better time to visit than fall. This is when the blueberry bushes turn a fiery red color and the birch trees are dappled with gold. Find Great Head Trail, a scenic hike that twists through pine forest and ends on a series of cliffs heading down to Sand Beach. Your dog will love a romp along the wave-crested shore. This extremely famous park in Arizona hardly warrants an introduction. The magnificent Grand Canyon is sliced by the Colorado River into 2 areas known respectively as the North and South Rims. The North Rim is off-limits to dogs. However, leashed dogs are welcome on the South Rim, which is by far the most visited section of the canyon. Just stick to the official trails above the rim (the ones below it are narrow and frequently steep), and beware the heat. This heavily forested park in northwest Virginia boasts 500 miles of trails, and dogs are welcome on all but 20 of them. The park straddles the Blue Ridge Mountains and is known for wetlands, waterfalls and rocky peaks. 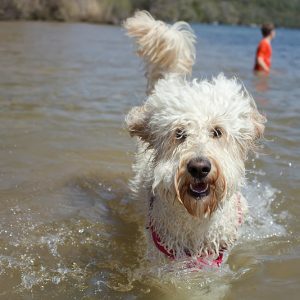 There are many natural swimming holes that you can enjoy with your dog, such as those on the White Oak Canyon and Overall Run trails. Named for a tributary of the Potomac river, Shenandoah also features great whitewater rafting. Due to puncture possibilities, dogs are not allowed on rafts. They are, however, allowed in canoes and (if small) in kayaks. Named for its large concentration of petrified wood (fossilized remains of plant material), this park in northeastern Arizona impresses with its desert colors, badlands, buttes and mesas. 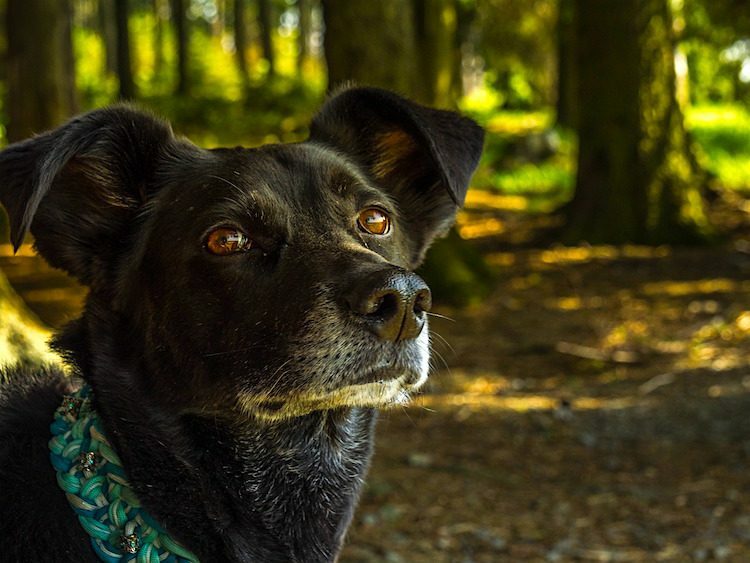 Dogs are allowed on all official trails (just avoid the backcountry). Don’t miss the Painted Desert, with its spectacular colors, and Newspaper Rock, which boasts one of the largest known collections of petroglyphs (rock carvings). If walking in the sweltering heat isn’t your thing, you can also take in much of the park’s unique geologic formations by car. Located in the Canadian province of Nova Scotia, this park is known for its spectacular highlands and breathtaking ocean scenery. To get there, fly to Cape Breton’s local airport and take the famous Cabot trail up to Ingonish Beach, 1 of the park’s 2 main entrances. Once inside, you’ll find waterfalls, forests, mountains, beaches and freshwater lakes, as well as moose, bald eagles and possibly black bears. In the fall, the green highlands are awash in color, making it a great destination for leaf peepers. 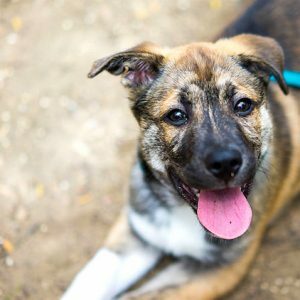 This article on dog-friendly national parks was written by Nicole Drummer, a wine professional, freelance writer and dog lover based in New York City. 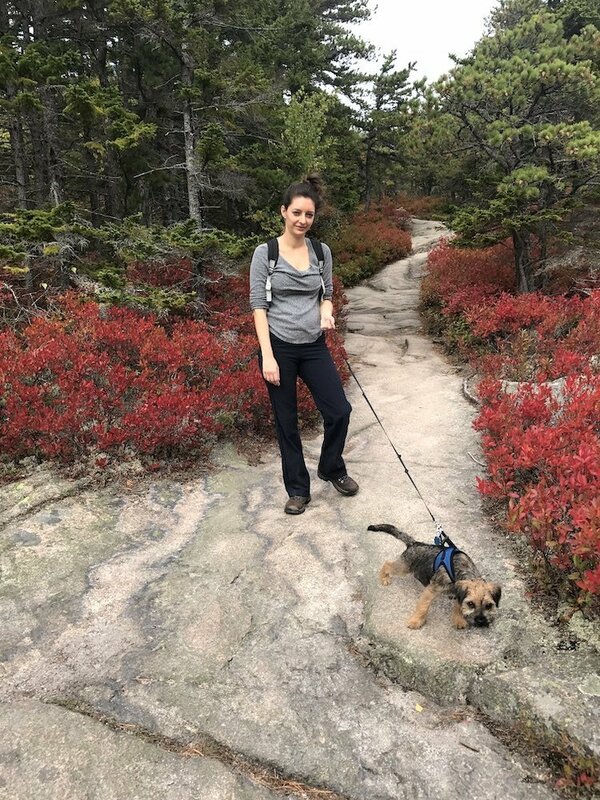 Nicole travels frequently with her Border Terrier, Belle, and posts all about their adventures on her travel blog.